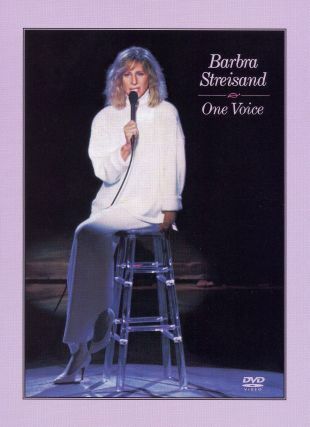 Originally broadcast as an exclusive special on HBO, Barbra Streisand launched her September 6, 1986 concert One Voice, in part, as a protest against Reagan-era nuclear arms proliferation in the late Cold War; the event marked the diva's first official live performance since 1972. Streisand and co. staged the endeavor in the artist's own backyard, beneath an open sky, with tickets originally going for $5,000.00 per and such celebrities as Chevy Chase in attendance, but the concert can now be enjoyed again and again by audiences everywhere in this first-time home video issue. The gig features a once-in-a-lifetime lineup of guest performers in addition to Streisand, including a routine by shtickmeister Robin Williams and musical support from giants Barry Gibb, Burt Bacharach, Carole Bayer Sager and Richard Marx. The video serves as a companion piece to Streisand's April 1987 album of the same live performance. Tracks include: "Somewhere," "Evergreen (Love theme from Star is Born)" "Something's Coming," "People," "Send in the Clowns," "Over the Rainbow," "Papa, Can You Hear Me?" (from Yentl), "The Way We Were," "It's a New World," "Happy Days Are Here Again," "America the Beautiful," and two duets with Gibb, "Guilty" and the showstopper "What Kind of Fool," both culled from the 1980 Streisand/Gibb album, Guilty.